The Hugo Boss Touch may sound delightfully straight-laced, and in many ways that perfectly sums up Boss' new fashion-forward Android Wear 2.0 smartwatch. Yes, the Hugo Boss Touch smartwatch is a perfect representation of its brand. Smart, professional and classic. Reassuringly well built, yet not designed to rock the boat in any way. Built into the shell of a classic wrist watch, we saw the Hugo Boss Touch in black and silver, with both leather and link bracelets. It's pretty pleasing on the eye, and it effortlessly carries more design gravitas than, say, the LG Watch Style or Samsung Gear S3. We're still waiting for the thickness and dimensions of the Hugo Boss, but there are no problems here in terms of heft. It's probably too big for really slender wrists, but measures around 12mm deep, putting it in line with the Huawei Watch 2, and significantly slimmer than the Tag Heuer Connected Modular 45. The lugs dominate the design, holding in place interchangeable straps. The crown is also set at 3pm, and is a button for accessing the apps menu and getting back to the home screen. 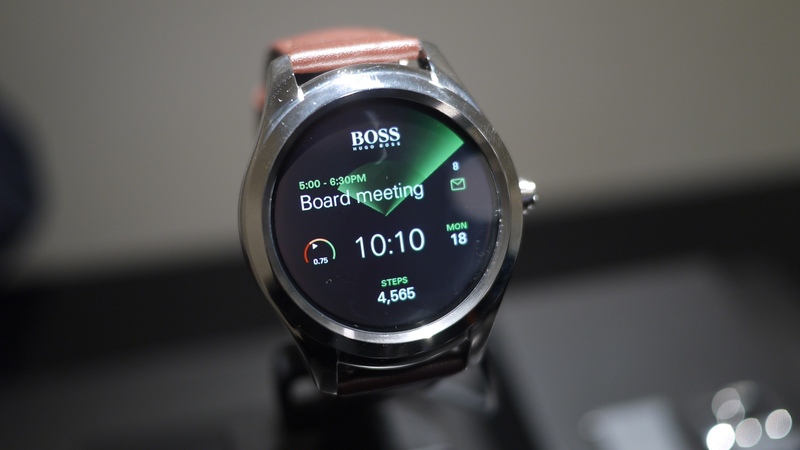 Hugo Boss hasn't chosen to take advantage of Android Wear's advanced bezel or crown control. Again, we're still waiting on confirmation of screen resolution. But it's impressively specced, and we didn't notice any graininess or pixilation. Colours were strong and Hugo Boss' bespoke dials and watch faces looked fantastic. On that matter there are five Hugo Boss branded dials to choose from, many sporting business centric complications, displaying your next meeting or calendar entry and putting step counts front and centre. We don't have any information on micro apps for the Movado or Hugo Boss brands, and we expect it to be a pretty vanilla experience. You will find NFC on board, which means Android Pay will be a key feature for the Hugo Boss – and it's one we can see the brand boasting about come launch day. The Hugo Boss Touch will be $395 when it arrives in August, alongside the boldly designed Movado Connect. That's fairly competitive among the new wave of Android Wear 2.0 smartwatches. It's undercut by the superbly priced $295 Tommy Hilfiger TH24/7You, although that smartwatch forgoes NFC, and it's watch face designs are, shall we say, a little more Americana than the Hugo Boss.